Caring for a dog with sarcoptic mange is challenging. Sarcoptic mange, also known as canine scabies, is a skin condition caused by the Sarcoptes scabiei mite, a pesky parasite that digs into the skin causing itching, scratching and consequent crusting and hair loss. 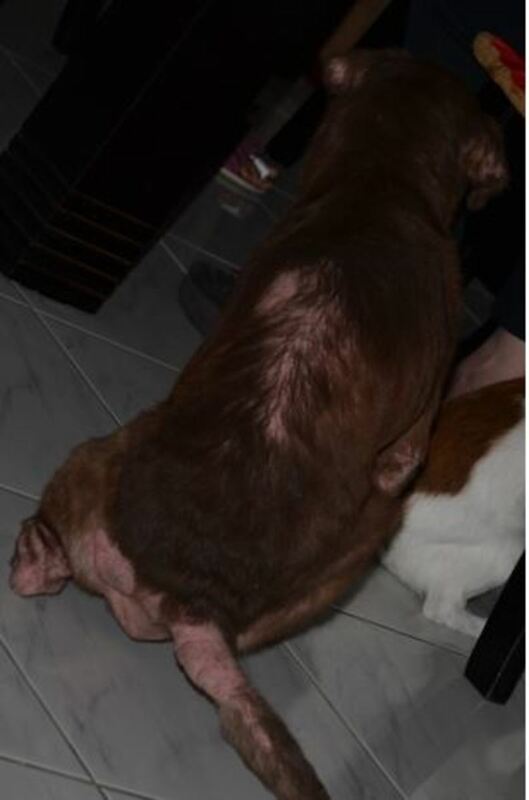 Caring for a dog with sarcoptic mange is not an easy task, it require lots of time and patience. For those determined to win the battle, here’s some inspiration: a personal story on Milo’s battle with sarcoptic mange by our guest writer Van Alcazar. For all we know, when we got Milo as a puppy in 2008 she might already have been infected with sarcoptic mange. Although she was a gift to our daughter, she soon became the favorite family pet. Milo, like many dogs in the Philippines, did not have registration papers but we were told that she was a cross between a Labrador retriever and a poodle. 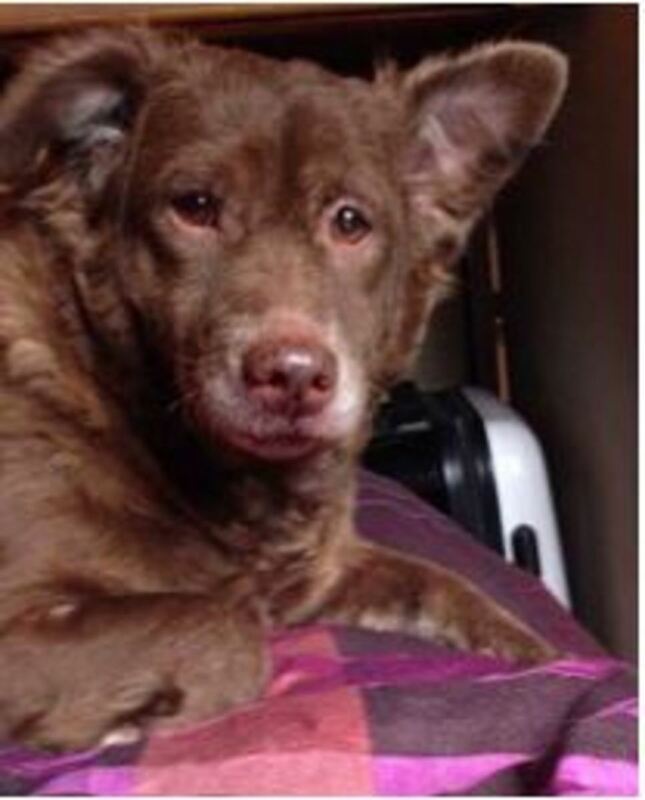 She is a medium-sized dog with a thick, dark brown coat. She turned out to be sweet but also fiercely protective of her masters. Her battle with mange has already been a long and painful one…. Sarcoptic mange is a highly-contagious skin disease found in dogs caused by the Sarcoptes scabiei mites. In the Philippines where technically, more dogs qualify under the strict definition of ‘stray’ rather than housed, it can be assumed that majority have mange due to frequent interactions among stray dogs. How and where Milo acquired it remains unknown to us because of the limited information about her history. As a pup, the only symptom Milo exhibited was a constant itchiness on random parts of her body. We thought scratching was a normal thing that dogs do so we were not at all alarmed. During summer, we noticed that the hairs on her tail and back would thin out and even fall. Regular baths with an oatmeal-based mild antiseptic soap alleviated the discomfort while an ordinary coat shampoo helped grow the hair back after a few weeks. This was our regular cycle for several years. However, more symptoms appeared as she grew older. The scratching became more intense and frequent – to the point that there were nights she could not sleep comfortably. 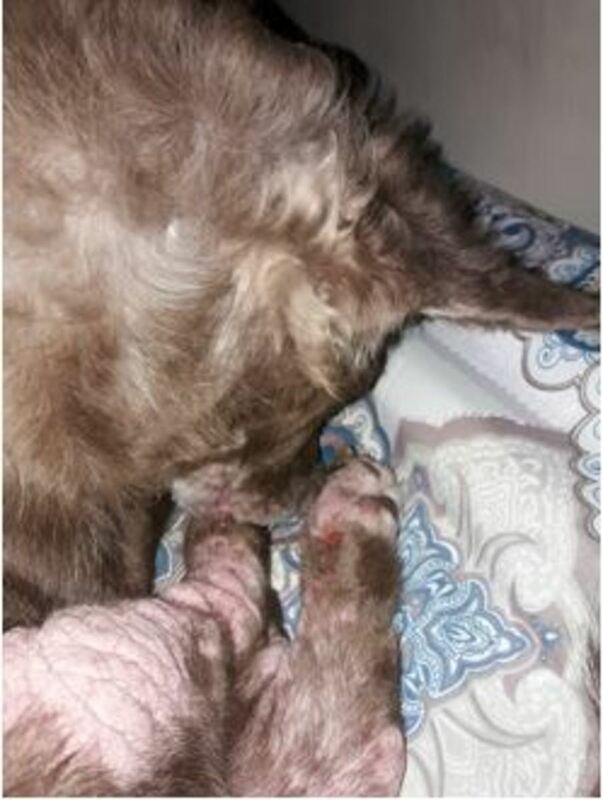 Some rashes appeared on her skin, and due to the constant scratching, the skin sometimes broke on a part of her leg. Flakes and crusts formed on some areas. She suddenly lost a lot of hair on her back and tail and developed what looked like “elephant skin”. Seeing her suffering and half bald broke our hearts as pet owners. Her usual antiseptic was now useless on her condition. At this point, we had no idea yet what was wrong with her. Her worst episode a few years ago caused a quick hair loss on half of her body. A visit to the vet revealed that Milo had a severe case of sarcoptic mange. 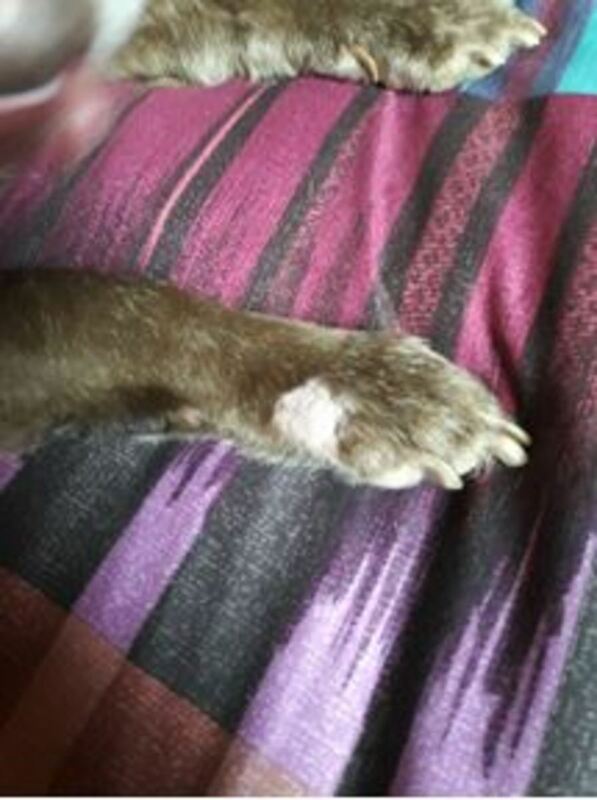 Although the usual test of skin scraping did not completely confirm it, her symptoms were consistent with mange. The severity of the signs also signified that the mites have spread to many parts of her body. She would already need drastic treatment. We’ve always felt pity for dogs we’ve seen who have totally lost their hair and had wounds and rashes on their bodies. We could not let our Milo fall to the same fate. We were determined to carry on a regimen to help her win over the disease. We learned from several veterinarians that treatment of mange takes anywhere from 4 to 6 weeks or even months. Treatment had to be continuous and without let up. It means that as a dog owner, one will have to commit to follow through with the medication, precautions and treatments during the period until all the mites and their eggs have been killed in the dog’s body. We decided that we had to do it for the sake of the dog. 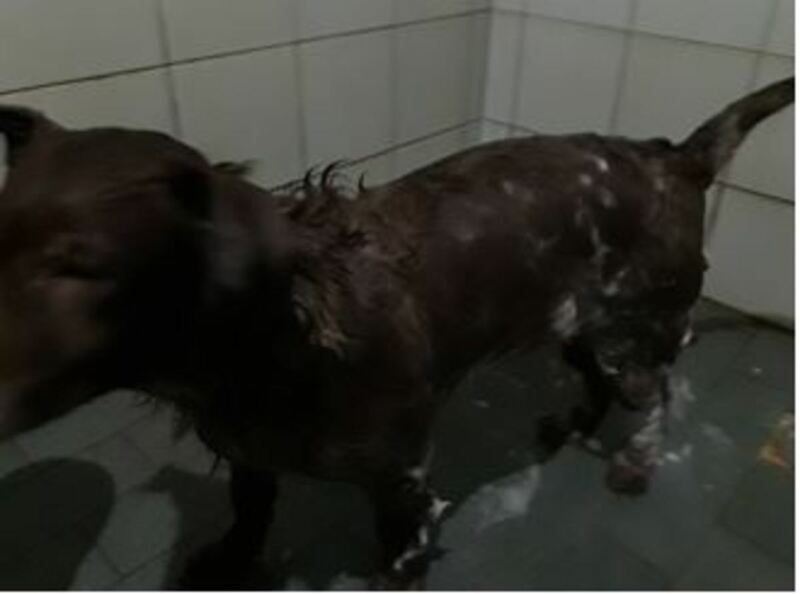 Under veterinary supervision, we went through with Milo’s treatment which consisted of a medicated bath 3 times a week, a soap and shampoo routine and also a daily application of a parasiticide on the affected skin. Here is a summary of the treatment plan when caring for a dog with sarcoptic mange. First step – we used a medicated herbal soap (picropetin with virgin coconut oil) on the entire body and not just on the visibly affected areas. We would wet her entire body, apply the soap all over and worked up a lather, let stay for 15 minutes then rinse. We did not dry her yet. Second step – follow through with an antibacterial and antifungal shampoo. Again, the body should be wet, apply the shampoo and massage to a lather all over her body then leave for 3-5 minutes before rinsing. Rinse thoroughly after the prescribed time then towel dry and blow dry. We always used a fresh, clean towel to dry her. It is important that the person giving the bath wash his or her hands thoroughly afterwards as these mites can also affect humans. Here is the daily application of a parasiticide on the affected skin. The medicine is mixed with virgin coconut oil and applied to the obviously affected parts of the body using cotton as an applicator. Always use a fresh ball of cotton for each area and dispose the used cottons properly and immediately. The mixture is applied twice a day – once in the morning and once before bed time. The vet also prescribed steroids for severe itching. Milo was prescribed with oral steroids as an additional solution in case of very severe itching, but we have not come to that situation yet. Ensure that her environment is always clean. Although she is mostly indoors, dirt and dust still manage to find their way inside the house. We make sure the areas she usually stays on, including her sleeping spot, are always sanitized. Some recommended to use residual insecticide to clean the areas but we only used mild floor cleaner solution for the job as strong floor chemicals tend to irritate the dog’s paws and skin on contact. Minimize contact with ‘stranger’ dogs. Mange is easily transferred so we prevent her from having close contact with dogs we are not familiar with. Control food intake. Milo loves to eat but she sometimes grows tired of dog food so we normally let her try out different kinds of food. During her treatment period, we had to pay attention to her diet. We shifted her to a lamb and beef dog food and totally avoided chicken for her. Sometimes she would get a treat of table food but we made sure she does not get a wayward chicken skin or a bit of fish meat. Prevent from scratching too much. When Milo begins to furiously scratch her tummy or even when she starts to nibble at her paws, we tell her to stop and distract her from doing so by interacting with her. Constant scratching would produce cuts and wounds and help spread the mites to other parts of the body so we have to help her minimize the actual scratching physically. We also made sure to trim her nails regularly. Recovery takes time so be patient. Milo’s hair returns slowly during treatment. One bad thing about sarcoptic mange is that it can not really be prevented. Our only hope is that we prevent our dog from contracting it severely or continuously. Dogs who get healed of mange and manage to reacquire it immediately start itching. It appears that they reacquire it on a more serious level than the previous episode. We can also try to observe the precautions to minimize the possibility of grave exposure so that in case the dog gets infected, treatment can be short, easier and less expensive. Medicated dips. Your veterinary clinic would be able to do this for you. This is usually done for very severe cases and there is a range of medicines currently available for this purpose. However, these are very strong chemicals and not all dogs are suited for this kind of treatment. Anti-itch medicines. Some vets will recommend administering an anti-itch medicine in cases where the scratching is already affecting the dog’s health such as not being able to sleep at all or is already bleeding from scratches. However, not all of these medicines will directly address the source of the problem – they are just remedies. Natural herbal baths. One success story we’ve heard is a student who used a daily herbal bath to treat an infected stray he picked up. First he boiled clean guava leaves in a pail of water. Then after cooling the water, he used it as a final rinse on the dog. Guava leaves are known to have an antiseptic property. There may be other herbs or leaves in your area that can do the same. Others also recommend an apple cider vinegar solution as a bath. Salt baths. Brine water is used as a rinse after the dog’s regular bath. Some owners take their dogs to the beach and let them swim in the ocean for a salt bath. Hair-growing shampoos. To help the quick re-growing of the fallen hair on the dog’s body, there are many shampoos that promote hair growth available in pet stores. However, you must wait until the dog’s medicated bath treatment period is over before switching to this type of shampoos. Milo is showing signs of winning over mange. Hair has grown back on her paws and hopefully soon, she is back to normal! Caring for a dog with sarcoptic mange requires patience, time and persistence. Most treatments fail because the owners fail to continue to do the regular activities necessary to kill the mites. Treating sarcoptic mites and other parasites for that matter is practically going into a war. You neither can stop nor call a cease-fire because the parasitic enemies will recover and grow stronger the moment your rest. You have to keep at it until you win. Milo’s battle is still going on. We have lost count on how many episodes she already had to go through but this time it’s less serious than before. So far, she is responding well and is already showing signs of improvement. Her scratching has lessened and she is less interrupted in her sleep by the itchiness. Some bald spots now have hair growing on them. We are actually winning. Seeing this progress, we are more inspired to continue caring for her. It takes up a lot of our time tending after her but a pet, no matter how old it gets, remains like a helpless baby that needs constant care – more so if the pet is sick. With the signs that we are seeing, we believe that it’s just a few more weeks before Milo’s battle with mange will be over and she will once again have victory. Can Black Widow Bites Kill a Dog?